A UAMS research team led by Vladimir Zharov, Ph.D., D.Sc., and including Ekaterina I. Galanzha, M.D., Ph.D., D.Sc., is the first to manipulate circulating blood cells in the body with the use of noninvasive ultrasound and lasers. LITTLE ROCK — A University of Arkansas for Medical Sciences (UAMS) research team led by Vladimir Zharov, Ph.D., D.Sc., is the first to demonstrate noninvasive, remote manipulation of blood and lymph flow in the body. This discovery makes possible several advances, including blood transportation without vessels, blood stopping to prevent bleeding, and focusing blood flow to a single file in order to analyze single cells for the presence of disease. The team’s findings were published in the March 16 issue of Scientific Reports, a prestigious scientific journal published by Nature Publishing Group. The article can be found at www.nature.com/srep/2016/160316/srep21531/full/srep21531.html. Ultrasound focusing of blood flow directly in the vessels is shown in this image. “We have demonstrated for the first time the ability to manipulate circulating blood cells in the body with the use of noninvasive ultrasound and lasers. Being able to perform single cell analysis on blood circulating in the body will open opportunities for early diagnosis of cancer, infections such as malaria, clots, sickle cell disease and other abnormalities with up to a 1,000-fold increased sensitivity and high accuracy,” Zharov said. Zharov is director of the Arkansas Nanomedicine Center at the UAMS Winthrop P. Rockefeller Cancer Institute and a professor in the UAMS College of Medicine Department of Otolarynology-Head and Neck Surgery. UAMS scientists collaborating on the research were Ekaterina I. Galanzha, M.D., Ph.D., D.Sc., associate research professor, and Dmitry A. Nedosekin, Ph.D., and Mustafa Sarimollaoglu, Ph.D., both research associates, all in the Department of Otolarynology-Head and Neck Surgery, as well as former colleague Mazen A. Juratli, M.D., Ph.D., and scientists from research institutions in Russia. Wall-free blood transportation using virtual ultrasound walls is shown in this image. “To date, manipulation of single cells with different methods was possible only outside the body. Now, we have demonstrated manipulation of cells in blood’s natural biological environment, the human body that may revolutionize many biomedical studies. In combination with imaging performed on a living person, this could make the dreams of single cell analysis in circulation come true using the principle of flow cytometry,” Galanzha said. Conventional (in vitro) flow cytometry is a technique for identifying and sorting cells and their components, usually though the use of laser beam illumination of cell flow in an artificial tube. Zharov’s team previously pioneered in vivo (in the body) flow cytometry for laser blood testing directly in the vessels, which allows for detection of extremely rare tumor cells or bacteria in blood. “Counting every single blood cell in in vivo flow cytometry is challenging due to the volume of cells. 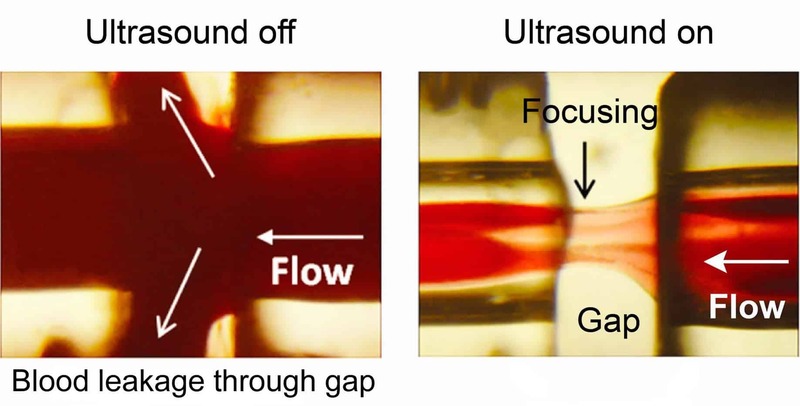 Our latest work demonstrates the ability to use gradient acoustic forces induced by ultrasound and photoacoustic waves to focus blood flow in the living organisms almost in single file, making it possible to analyze single cells with much greater accuracy,” Zharov said. Photoacoustic waves are formed by delivering laser pulses into blood, while ultrasound waves inside blood vessels are delivered from a sound generator. Manipulation of the circulating cells was demonstrated through single cell trapping, redirecting between vessels, noninvasive wall-free transportation of blood, and potential cell sorting. The study also showed the potential for photoacoustic detection and identification of individual sickle cells and white blood cells targeted by functionalized nanoparticles. “This new concept of blood cell manipulation in vivo can lead to developing unique biological tools for a variety of preclinical studies of disease, and we now have a vision how to use this technology on humans in the future,” Zharov said.